The British Airways On Business program rewards small businesses based outside of the US and Mexico for their flights booked on British Airways, American Airlines and Iberia. On Business is a loyalty program (or programme) for small businesses by British Airways. You earn points when booking travel, which you can then redeem for free flights and upgrades. You earn more points the more you spend, and you can track your travel spend. A big difference with On Business in comparison to any other corporate airline program is that you sometimes have the option to either earn points or receive an instant cash discount on the price of a flight. Note the “sometimes” though, it’s not often that the exact route and dates you want to fly will match up with the discount route and dates. You can’t enroll in the On Business program if you’re located in the US or Mexico, it refers you to join American Airlines’ Business Extra program instead. Many other countries are supported (including Australia, Canada, Germany and Japan) but you must enter a Tax ID number for your company when registering. What is the difference between On Business points and Avios? On Business points are the reward currency for companies within the British Airways’ corporate program, whereas Avios are for individuals only. You can earn both on each flight you take, you’ll earn Avios for flying and On Business points for paying. And you can also earn On Business points for any of your employees traveling. How do I earn On Business points? The points you earn will depend on what you select as your preferred currency when signing up. As a UK company, starting out you earn 1 On Business point for every £1 spent. If you select USD as your preferred currency, you earn 1 On Business point for every $1 spent. You don’t earn points on government taxes and fees. 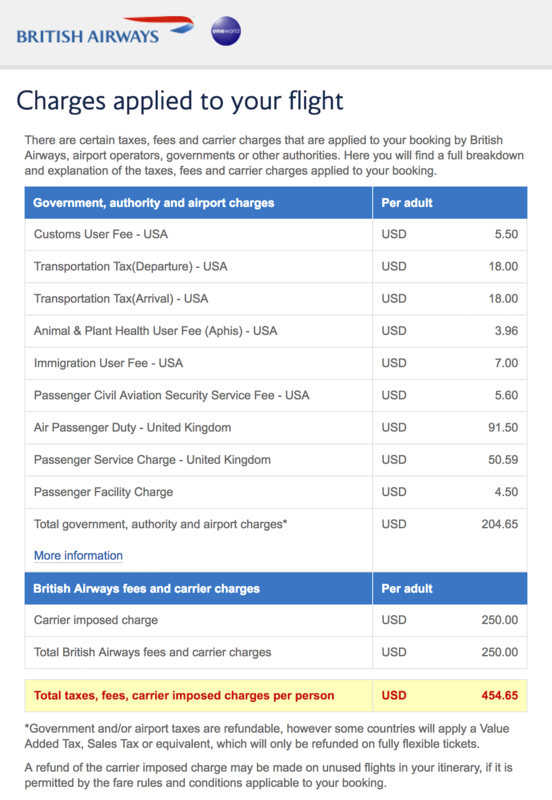 You can see in the below example that the base fare of a round-trip flight from New York to London in August is $222.00 and there’s $454.65 in taxes and fees. When you click the small information icon next to the taxes amount, you’ll see the taxes split out into government fees and BA fees. In this example, you would earn a total of 472 On Business points for 1) the $222.00 base fare and 2) the $250.00 BA fees. There are different “Tiers” in the On Business program depending on how much you’ve spent. Once you spend £30,000 (or US$30,000) in a year, you’ll then earn 1.25 points for every £1/$1 spent over that amount. And once you spend £300,000 (or US$300,000) you’ll earn 1.5 points for every £1/$1 going forward. If you know anything about exchange rates, you’ll see that there’s a much larger earning power for USD-based companies than GBP-based. You can book through any channel (travel agency, online on BA, online on another travel site etc) and receive On Business points, however the tickets must be issued by British Airways (ticket numbers beginning with "125"), Iberia ("075") or American Airlines ("001”). The operating airline must be American Airlines, British Airways, BA CityFlyer, Iberia, OpenSkies, SUN-AIR or Comair. It can also be a BA codeshare operated by Japan Airlines, Qantas or US Airways, but again it has to be ticketed by BA in this case. Currently On Business is offering triple points for new companies on their first 6 flight sectors (individual direct flights, if you need to connect via another airport it will count as 2 sectors). How can I use On Business points? 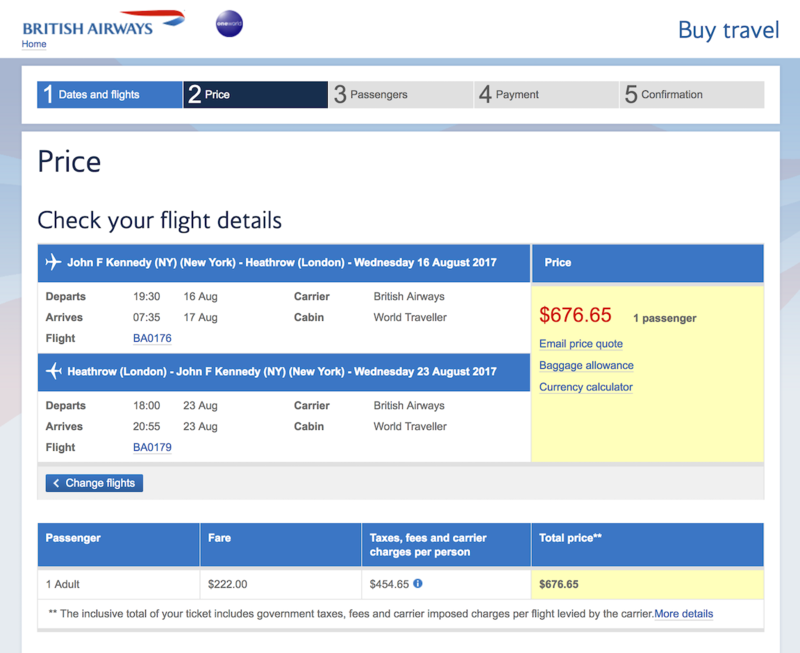 You can only redeem an award flight on British Airways, American Airlines or Iberia. Unfortunately the full OneWorld award inventory including airlines like Qantas, Finnair etc is not included in On Business. You also can only start to redeem award flights once there are at least 2 travelers adding the On Business number to their itineraries. This is to stop sole business owners (without any employees) registering for the program as it’s specifically marketed to companies. On the plus side, there is more availability of award seats when redeeming On Business Points than with Avios. There are no published award charts for either so I’ve searched a few different routes to give you at least an idea of the On Business redemption amounts. Note that these can change at any time, but once you’re registered you can search for specific routes in the Points Calculator. Back in the day, a business class award would only be 2x the economy points which was a great deal as generally the business class cash price is 5-7x the economy class price. BA, along with many other airlines, have increased the points required to redeem a business class award over the last few years. You can see here in these examples that using on Business points for a business class award requires 4-6x the points of an economy class award, a similar multiple to cash prices. Generally the farther you fly in physical miles, the better the redemption value of your points, but you also need to compare the cash cost and whether it’s better to save the points for future travel or use them for an upgrade. There’s also no upgrade award chart so I’ve searched the same routes to compare redemption values. Interestingly, for a flight from London to Sydney, an economy flight award is 8,000 points and a business flight award is 35,000 (27,000 more points than economy), however an upgrade award from economy to business is only 19,000 points. This means that generally it makes better sense to pay for an economy ticket and upgrade to business class with On Business points at checkout. I quickly looked at prices for a flight in August, and you can see that you get almost double the value of each point if you use them for a business class upgrade rather than an economy flight award. On the surface, On Business seems much more complex than other corporate airline programs. But with complexity can come big rewards. If you’re booking at least $10,000/year with British Airways, American or Iberia, the I highly recommend signing up for On Business. It’s a double dip on points where you’ll earn at least one free flight a year. We specialize in helping you get the most out of any airline program that you’re enrolled in, whether corporate or personal. If you’re unsure how to use the points you’ve earned, get in touch, let us know what you’re working with and what trips you have planned for the year ahead.